One of the BEST decisions we made was to work with Siobhan Bogle at the Maine Tinker. She is a miracle worker! Honestly one of the nicest humans and a stellar photographer. She put our whole family at ease, and efficiently shot the most stunning photos. It was fast and friendly and the shots came out so awesome! I adored working with her and could not recommend her enough. She made our day even more special. She made my partner and I feel so special, comfortable, and really captured such romantic moments. I still can't get over it! The Maine Tinker is completely unbelievably awesome! Siobhan is a true artist - she captured our wedding in exactly the way that I hoped, and with details I didn't even think to ask her to shoot. She made us feel so comfortable and ourselves when she was photographing us. She has great communication skills and was extremely prepared for our day - she got our input well beforehand, so she was sure to do her homework and we had no stress from her side on our day. Love her, recommend her to everyone! Maine Tinker was an incredible photographer for our wedding. We also had the Maine Photo Camper "Ricky" and everyone had their pictures taken in this camper. The pictures from the camper were hilarious and everyone had SO MUCH FUN! 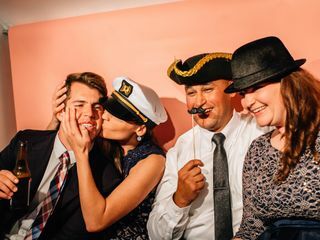 It was the single best thing we had at our wedding. We booked Siobhan for our city hall wedding. I had seen her work from a childhood friend's wedding pictures and knew I had to get her for my own wedding. From the initial email she got back to me so quickly! And we met in person and really clicked. She understood what we wanted and was totally on board. We even did our engagement pics in her house! The day of the wedding I was really nervous and overwhelmed (I'm not a great public speaker) she came early and was a calming presence to me. We had so much fun. Our wedding pictures were amazing. We always get compliements on them and people ask who our photographer was. I would recommend Siobhan to anyone. I would insist my sisters and best friends get her for their weddings. I will hopefully have more life events that require professional photography and I will call Siobhan! Siobhan is amazing! She is so personable and does fabulous work. It really felt like we were her only clients during the whole process. She answered emails very quickly but also was so reassuring and positive along the way. We were getting married in a new venue and we she was great at being flexible about the day and our needs prior to the wedding and during the actual day. She definitely had our best interests in mind. She also did our engagement photos and we loved them both. Her photos are so vibrant and are truely stunning! We couldn't be happier. We used the photo camper as well and it was amazing! It was the highlight of the wedding, well you know, besides getting married :). Siobhan is an amazing artist! The photos she captured are truly stunning and we could not be happier with her work. Her work is consistent. Both the engagement photo shoot and the wedding photos are great. Siobhan was absolutely amazing, and I am not just talking about the amazing quality of all the shots she took. She is very artistic but she is really able to capture and enhance the moment. She made everyone so comfortable when taking pictures. She was assertive enough as well which really helped keep everyone on track during the day. Everyone at our wedding (20 total) were shocked, no one ever saw her during the ceremony and people were generally concerned that she missed it. She did not miss it but she made it about us, no one knew where she was but she took amazing shots from all angles, capturing the true joy of our ceremony. Our wedding was outdoors in a quiet location. It was nice to have a photographer that worked to not take attention away from the ceremony. The best part was that he stayed at the event all the way to the end. It is with our highest regard that we would recommend Siobhan to anyone for any occasion. She is a true professional and does not take the run of the mill shots; she is artistic and creative and will truly enhance your already memorable day. She made us feel like her only client, she paid a lot of attention to us leading up to our wedding and was never stressed. It was very easy to work with Siobhan. She is an excellent communicator and was always on time. She worked well with all of our other vendors. Siobhan got us sneak peak photos very fast and the remainder of the photos were delivered soon after. We would recommend her for any kind of photo shoot, but especially weddings! Siobhan of Maine Tinker Photography is truly a photographic artist. Her work is impeccable- with the utmost attention to detail while simultaneously capturing the movement and emotion of every event she photographs. Our wedding photos were beyond words! Siobhan was able to freeze moments in time, during a day that often moves so quickly. Many of the moments, details and interactions she notices and focuses on are the ones that we would have otherwise missed. The range of her portfolio is a testament to the artistic eye and style that she lives by and embodies in her work. 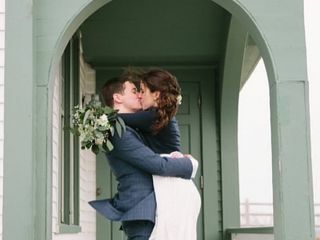 Working with Maine Tinker was an absolute pleasure from start to finish; Siobhan made my husband and I feel completely at ease from the moment we made initial contact through to the very end of our wedding day. There is an instant connection Siobhan is able to make with her clients that allows her to invest in them and their "stories." She makes every client feels as if they are the ONLY client. She is the consummate professional in all ways and we cannot wait to work with her in the future! 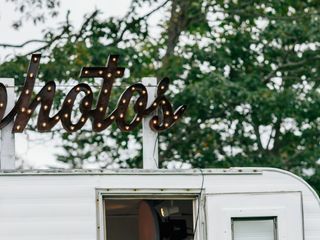 We used The Maine Photo Camper for our wedding in July and are so happy we did. It was by far the favorite activity among the guests, and there were lines of people waiting to use it all night long! The pictures came out fabulously and the props included are great. Even better, we got a copy of everyone's photos and they were also all uploaded online for all of our guests to view. We are so happy we found Siobahn and Geoff and that the photo camper was available for our wedding- it added such a unique and fun touch to our night. Siobhan of The Maine Tinker surpassed all of our expectations! We are both in the creative industry and have critiquing eyes of art school graduates. When it came to our wedding photography, we knew Siobhan was it. Her portfolio displays artful compositions, natural and dramatic light, and beautiful, muted colors. She has an incredible eye. We had our engagement session with her and were very pleased with the results. We knew she was going to capture our day perfectly. She met and exceeded all of our expectations for our wedding day. She captured EVERY moment. Each with an artful eye. We had so many wonderful shots to choose from, the hardest part was picking which ones we wanted to frame. Not only does she do amazing work, she is so wonderful to work with. Calm and focused. HIGHLY RECOMMEND. Thanks Siobhan!!!! 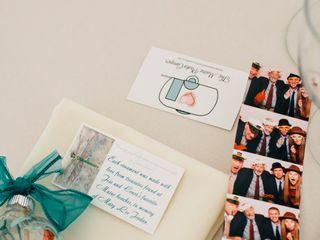 One of the things about planning and throwing a wedding that caught me by surprise was how much I would come to love the vendors that helped make the day so special. Siobhan of the Maine Tinker Studio is at the top of that list. Our first impression of Siobhan was based on the fantastic work found on her blog and website. Our second impression was based on our introductory phone call, where Siobhan was warm, direct, and easy to talk to. When we met her in person for our engagement photo session, we knew we had struck gold. Siobhan has a knack for immediately making people comfortable, for finding beautiful backgrounds and beautiful moments, and for capturing emotion and context. We could not be happier with the photos from our wedding, or with Siobhan as a true professional and overall wonderful person. We have no doubt that the body of photos she captured will become family treasures. We count ourselves very lucky to have had her be a part of our wedding. Siobhan is the best! Not only does she capture amazing shots, she's super kind and fun! She has a relaxed yet professional manner that put us at ease right from the start. She was always easy to communicate with and really *got* our vision of a relaxed, go-with-the-flow wedding, while also keeping us on track and making sure that the pictures we wanted were captured. Our photos had a great balance between beautiful, unique composures, and silly/funny/touching candids. Overall, we cannot recommend her enough, anyone lucky enough to hire her will definitely be happy with their decision. If I could rate The Maine Tinker higher, I would. My husband and I feel so fortunate we found The Maine Tinker for our engagement and wedding photos. She is so much fun to work with and so amazingly talented. She really made our day more fun and special! She was able to shoot gorgeous photos and really help capture our love with out of the box and candid photos. She was able to help us capture moments of laughter and joy without having all posed and forced photos. The photos we have look like they could go straight into a magazine, because she found the most beautiful backdrops, lighting and contrast. If you are still searching for a photographer- STOP and just call or e-mail The Maine Tinker. She honestly should charge 3 times what she does-she is that talented and amazing! My husband and I are so happy we chose to work with The Maine Tinker Studio for our engagement photos and wedding day! Siobhan was absolutely wonderful to work with, and our photos turned out so beautiful. We had our wedding in Maine and she was able to capture all the beauty Maine has to offer in the summer time. She listened to exactly what we wanted and the pictures reflect that. She has gained a lifetime customer from us! She first met with us for our engagement photos. We moved around the city to key locations to get those images we wanted. Not only did Sioban capture those images, but she also grabbed shots that I thought only existed in magazines. Those moments are well documented on our wedding day. From her arrival, she came through the door snapping images of artifacts I would never have thought about. She spent the better part of the morning with my wife and then met with me. She was beside us for the better part of the day. I could go on and on. She captured every moment and then some. Let me take a moment to explain that her photos are not your traditional stand in a line and smile. She finds the moments that reflect the day and convey real emotion. She is creative, thoughtful and most of all professional. She has a radar for a great image. People are still asking us how we get our wedding photos. We also took her up on using a Photo Camper; yes really! It’s not what you think. 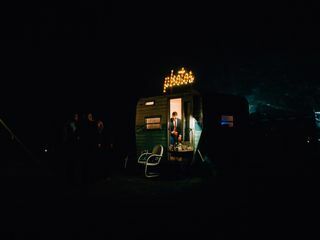 She has taken a vintage camper and repurposed it into a way cool and hip photo camper. My guest all loved the camper and we had trouble getting many guest out of it to come in for dinner. They wanted to stay and continue using the props. They even wanted photos outside of the camper because it’s as cool as the inside. Here cost was more than competitive. You might be considering a few photographers. Yes, you can find cheap photographers, but you can’t put a price on the moment or more importantly a moment missed. Her cost is far below her value. I’ve seen the work of photographers in the $5,000-$10,000 range and her work competes with them all day long. If I were looking for a photographer today, I’be be driving to her to give that deposit before my date is gone. Thank You Sioban and your crew for an outstanding and memorable wedding day that I’ll get to share with my family and friends for a lifetime! Working with the Maine Tinker was a blast! I was STUNNED on how the photos came out! She made it fun and got every shot we could have imagined! Siobhan puts her heart and soul into every photography session. She treats you like family and has the most talented eye for amazing shots that capture the moment. I keep looking at our wedding photos and every one of them is so good I can’t choose. It’s as if you’re back in the moment as you browse them. Book with Maine Tinker and you won’t be disappointed. Siobhan has taken our family photos five different times. She is a friend, artist and a person we trust. Every session captured valuable family memories. Taking a photo of my husband and I is easy. Yet, the real challenge comes when bringing out the best in our 2 and 7 year old boys! Sometimes they are happy and playful...other times they don't feel like being involved in the family photo session. Yet Siobhan is patient and young at heart herself. She relaxes the mood and gets the children to giggle. Before we know it, we have those family moments captured without much effort. I would highly recommend her talent and time to anyone. 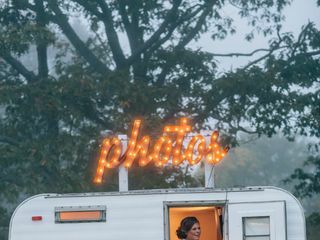 The Maine Tinker is the photographer who should be at any magical event.